A Breath of Fresh Air | Nicholas Hoffman & Co.
Just 90 days can make a world of difference. At the turn of the year investors were feeling the hurt having just experienced a prolonged stock market selloff. Equities had their weakest December since 1931 when the S&P 500 was down -13.5% for the month. Expectations going into the Q4 earnings season were low with investors fearing the worst – weakening macroeconomic data, bad corporate earnings, and the China trade war. The market today has a much different tone. 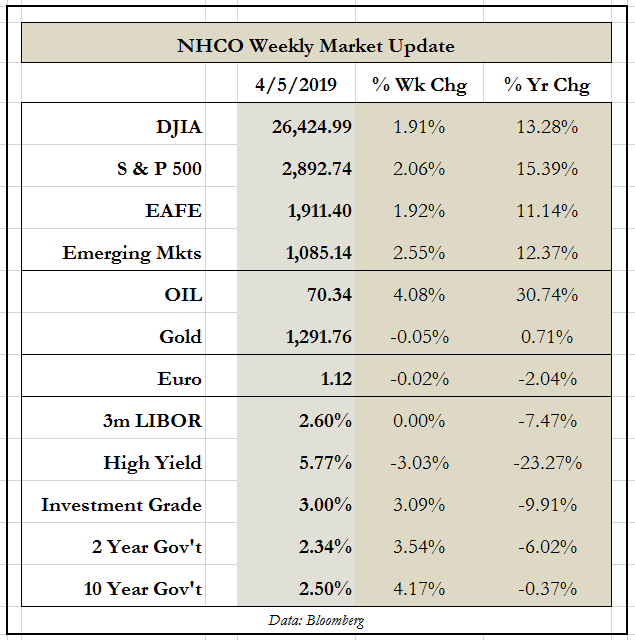 The S&P 500 Index has rebounded and returned 13.6% in Q1 2019. By early February, generally positive Q4 earnings results helped lift the market cloud. Inflation remains in check and a better than expected March jobs report of 196,000 showed the economic engine is still moving forward. The WTI benchmark oil price is trading at around $63 per barrel (up from $45 at year end) and U.S. 10-year treasuries are yielding 2.50% giving some relief to the mortgage market and corporate borrowers. In other world news, we’re starting to hear more positive news out of China. Data for March showed the first expansion in China’s manufacturing sector in four months. Some saw this news as a sign of rebound, while others perhaps a sign of stabilization. No surprise the Chinese stock market was one of the better performers in Q1 2019, up over 18%. 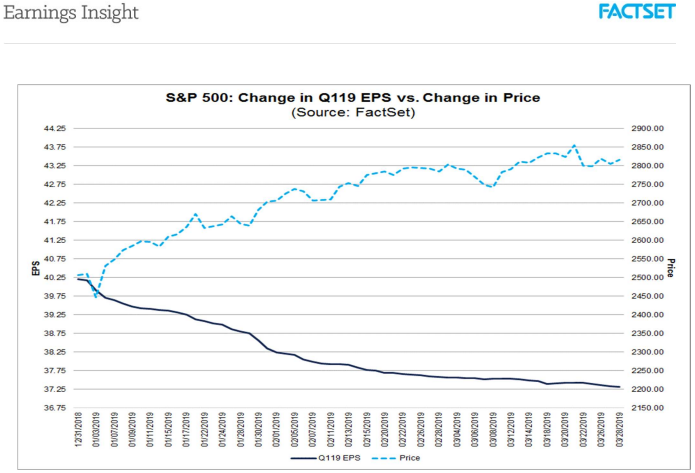 Below is a chart of the S&P 500’s price performance (dotted line) since year end along with analyst earnings revisions (solid line) from the beginning of the quarter to the end. As you will see, even as S&P 500 prices were rising, analysts lowered earnings estimates by 7.2%. We haven’t seen this magnitude of earnings estimate reduction since Q1 2016. It seems companies have been talking down their futures the past few months. These downward revisions to earnings estimates mean that the estimated (year-over-year) earning decline for Q1 2019 is projected to be -3.9%. Back at year end 2018, analysts were thinking the Q1 earnings growth year-over-year would be a positive 2.9%. Turning to revenue growth, predictions of an increase in Q1 of 6.6% have been reduced to 4.8% as compared to 12-months ago. For the balance of the year, analysts are projecting S&P earning growth of 3.7% for 2019. The 2019 revenue growth forecast is between 4-5%. It will be interesting to see how actual U.S. corporate fundamentals come into play as the Q1 2019 earnings season unfolds. I wonder what the Fed will be thinking if earnings come in better than expected. As one of my favorite television narrators would say after an exciting Batman episode, “Tune in tomorrow – same Bat-time, same Bat-channel!” for more information about corporate fundamentals. This entry was posted in Uncategorized on April 8, 2019 by nhoffmanandco.